Santa Fe - Today, Governor Bill Richardson endorsed Public Regulation Commissioner Ben Ray Luján for Congress in the 3rd Congressional District Democratic primary. "As someone who knows this district well - as a Congressman and now as Governor - I believe Ben Ray Luján is the most qualified candidate and is best prepared to represent the diverse communities that stretch across northern and eastern New Mexico," Governor Bill Richardson said. "I am also proud to endorse a candidate who has taken the high road against negative and unnecessary political attacks from some of his opponents," Governor Richardson said. "I trust Ben Ray Luján as the candidate who will stand up for New Mexico. 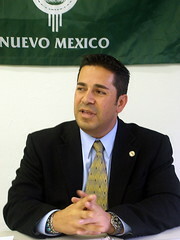 He has worked hard on the Public Regulation Commission to serve the people of New Mexico. No other candidate can match his record of fighting for consumers, increasing renewable energy production and creating regional solutions to climate change."